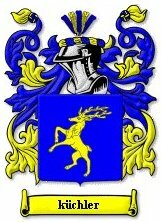 Kuechler "arms" -- a German-Saxon noble family. 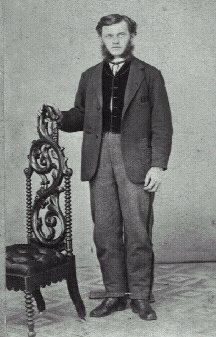 Edward Ernest Kuechler (Küchler) - from an 1880's vintage photo. Born 1841: Saxony, Germany - Died 1930: Rushville, Illinois. 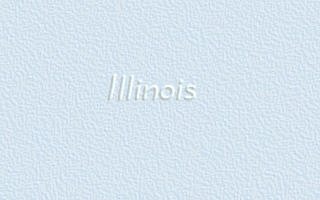 His parents settled in Jacksonville, Illinois after sailing from Germany (Saxony); he grew up in Arenzville, Ill; lived out his life in Rushville, Ill.
After the war, Edward resided in Beardstown, and Rushville, Illinois where he worked as a tin-smith. He is buried in Rushville community cemetery along side of his wife, Emma Katherina Wankel. (His son, Charles Edward Kuechler was father to my (-ed.) mother, Emma Louise Kuechler-Kuhmann (now 97 years, 3 months, circa December 2007). Mother knew Edward in life, when she was a girl living in Rushville. And traverse thereby, almost 160 years of living memory. 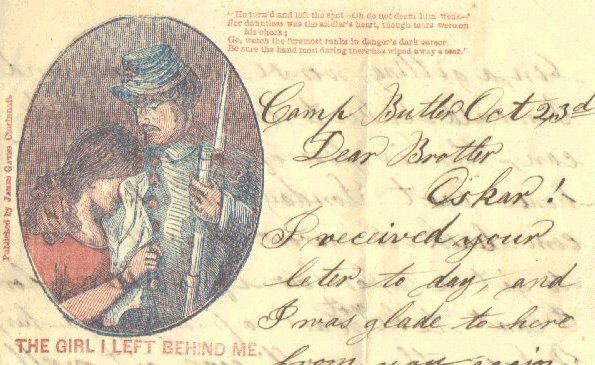 by Edward Ernest Kuechler in 1862, while at Camp Butler (Springfield, Illinois) prior to his departure into battle. translation is available (from the author) as a Microsoft WORD "rtf" document. In addition, I possess MANY 100-year-old (and older) original documents from folks who hailed from White Hall, Meridosia, & Rushville, Ill. There are also old photos, letters, heirlooms and furniture (even a 150-year-old platform-rocker that belonged to Edward & his wife while at Rushville). The Kuechler house was still standing in 1982 - during my last vist to the area. -ed. Robert Charles Kuhmann. 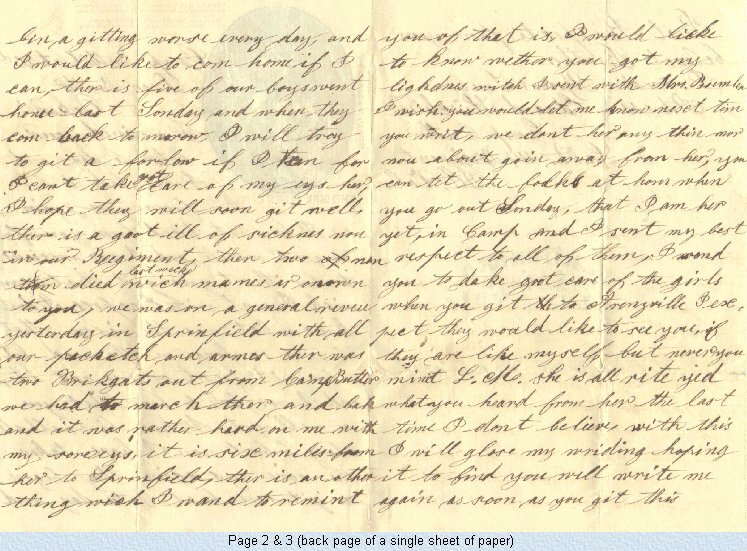 Here is a second letter (dated 23rd October 1862, Camp Butler - Springfield, Illinois). It has survived in nearly perfect condition - this one being written in English. 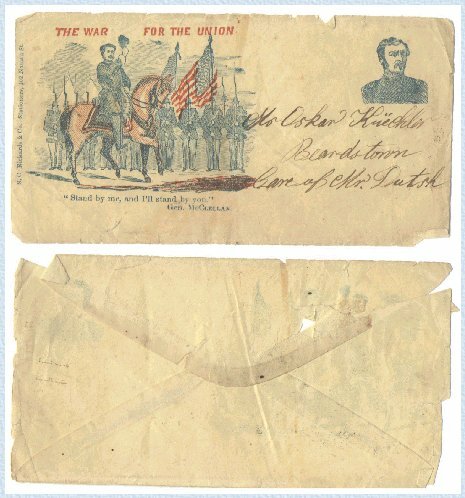 The front and back sides are reproduced as well as the original "General McClellan" mailing envelope. 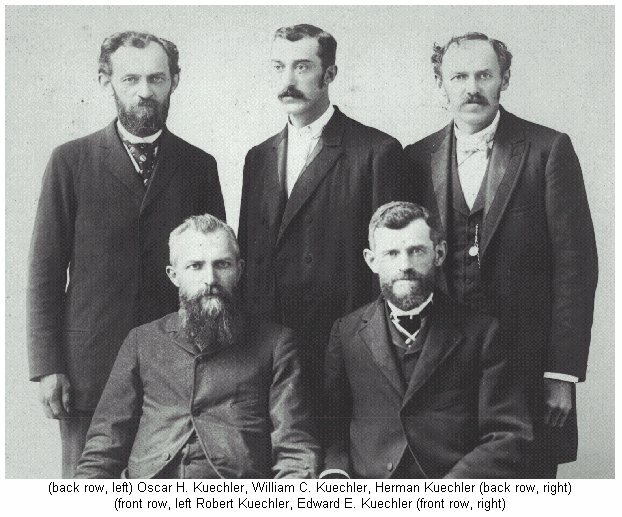 It was written to Edward's brother Oskar who was living in Bearstown, Illinois at the time. Oskar eventually moved to San Raphael, California where he is buried in Mount Tamalpais Cemetery. 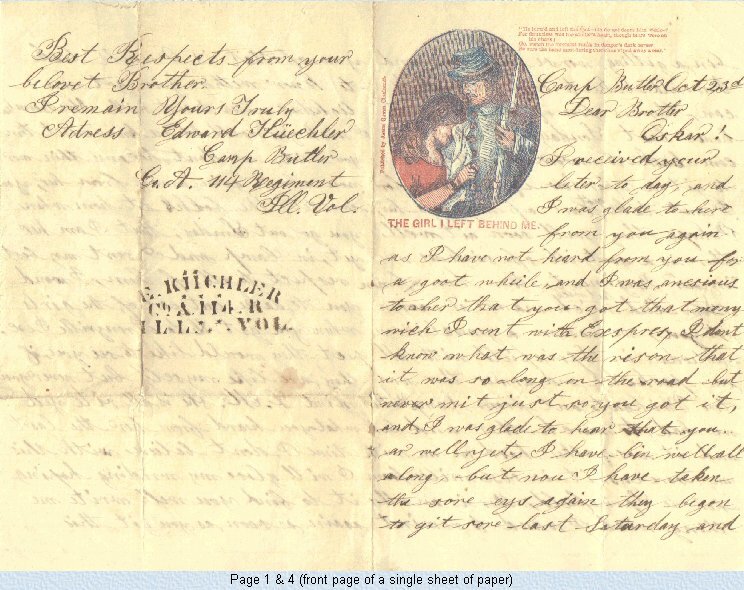 The letter was written by Edward Ernest Kuechler while at Camp Butler (Springfield, Illinois) prior to his departure into battle. 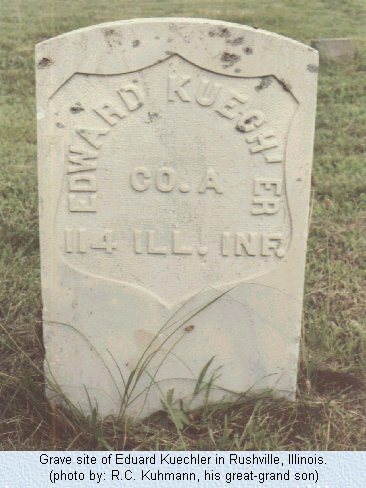 Edward is buried in the Rushville, Illinois city cemetery. The letter is reproduced here actual size (when viewed at 800x600 pixels - scanned at 250 dpi - 16million color JPG). Edward was my Great-Grandfather - Mother (his Grand-daughter) knew him in life - when she was a little girl living with her parents in Rushville, Illinois. These items are in my possession as of today (circa 13 December 2007). 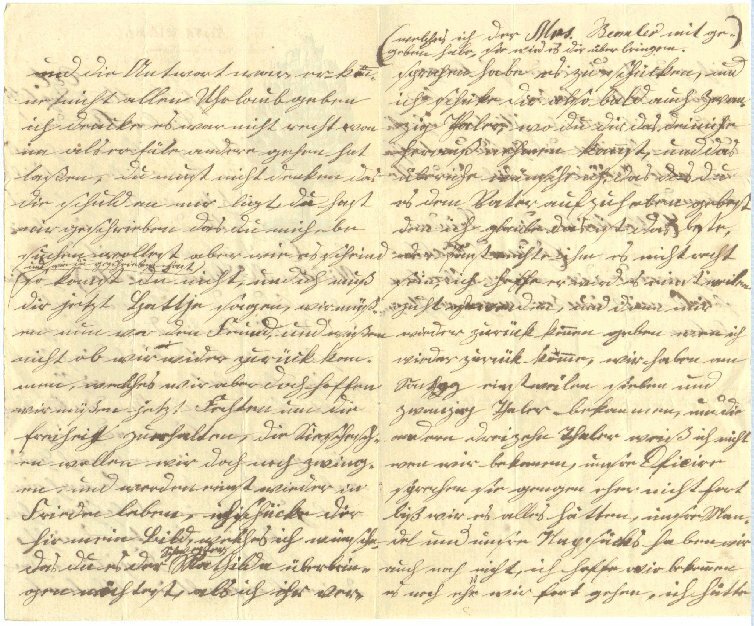 The spelling and grammar errors in Edward's letter are both amusing and quite understandable - for Edward was born in Saxony (German). By contrast. his German language writing is impeccable... He and his parents (Carl Wilhelm Kuechler and Christiane Caroline Concordia Fredericka Liebescher-Kuechler) immigrated to the USA at a time when he and his siblings were still children. The Carl W. Kuechler home (in Jacksonville, Illinois) still stands - and is used today (circa 2007) as a funeral home. Note: A modern transcription of the entire letter is available from the author in the form of a Microsoft WORD "rtf" document. Be sure the hand most daring there has wiped away a tear." "The War for the Union"
"Stand by me and I'll stand by you" - Gen. McClellan"
[S.C. Rickards & Co. Stationers, 102 Nassau St.] Springfield, Ill ??? 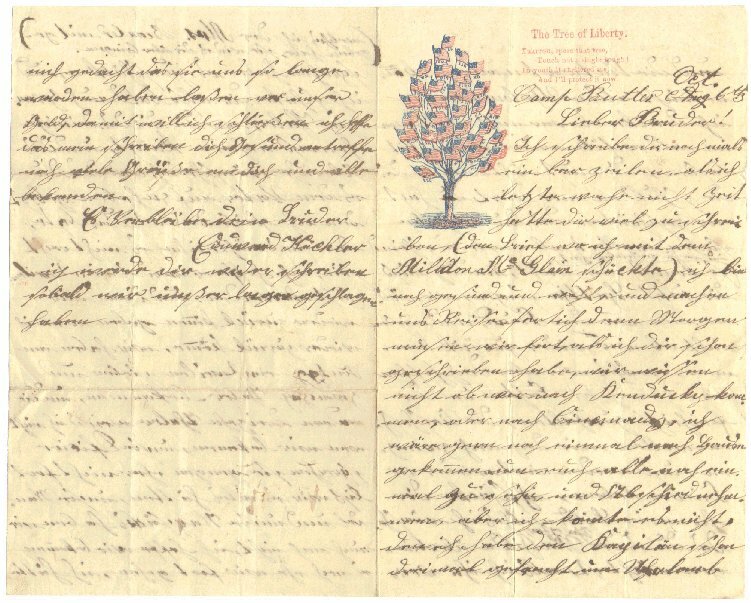 "Mr Oskar Küchler, Beardstown, Care of Mr. Dutch"
Detail of the original envelope - actual size is 2.5" x 5"
Edward's letter was sent to this man (Oskar Kuechler). 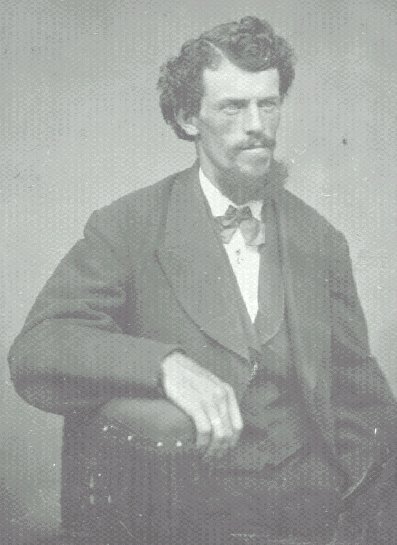 James Richard Kuhmann, a Great-Great Grand-son of Edward Ernest Kuechler. The photos and letters reproduced here may not be copied for any purpose, without the written consent and permission of the author. Copyright ©1999-2012 R.C. Kuhmann All Rights Reserved - All Wrongs Avenged!